RapidTyping will help you learn how to use your keyboard more efficiently in a few easy sessions for absolutely free. Children will learn by playing a fun game, while students and adults can choose pre-configured lessons or create their own training courses. RapidTyping teaches adults and kids, students and teachers, and offers advanced reporting and progress tracking for every student. Advanced statistics include 15 different parameters, such as words-per-minute, characters-per-minute and accuracy reports. The innovative typing tutor features a simple and intuitive user interface painted with colors to make learning to type fun. 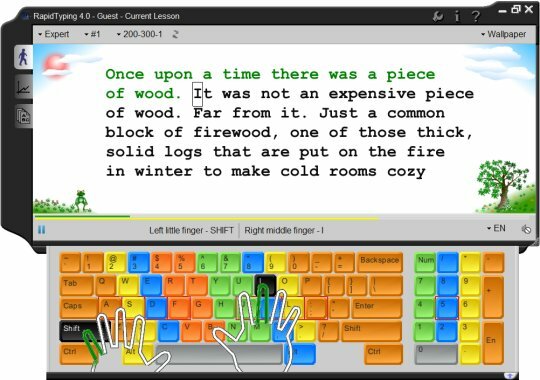 The typing tutor offers many visual aids to help adults and kids learn the computer keyboard, and includes full course statistics in both tables and diagrams. Multiple user support makes RapidTyping a perfect tool for educational facilities such as schools and universities. Professional typists, teachers and writers will find the ability of Rapid Typing Tutor to create their own courses tailored to each student truly invaluable. Custom lessons and courses allow designing your very own typing tutor tailored specifically to your needs. Whether it’s a certain key, set of keys or a keyboard layout that you need to learn, a custom-made typing tutor is your best bet. Rapid Typing Tutor features a complete virtual keyboard with both hands moving over it to show the correct typing position for each hand and finger. Highlighted zones for each finger help you learn placing your fingers properly a second nature in no time. For non-standard layout users, Rapid Typing Tutor will automatically create a new virtual keyboard based on your chosen layout. You can learn typing on multiple keyboard layouts by quickly switching between them. This program shows training statistics both in tables and diagrams. This reflects typing speed and mistakes quantity.